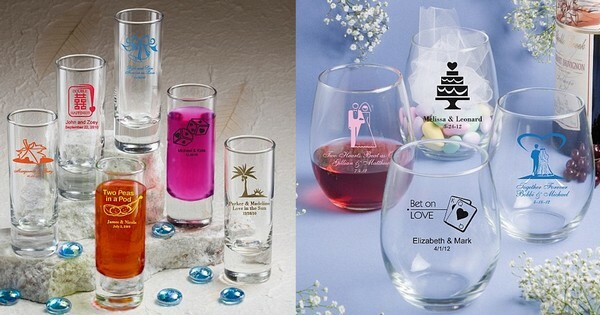 Shop glassware personalized with choice of wedding design and up to 3 lines of custom print for wedding guest favors. Choose from a variety of glassware sizes and styles including shot glasses, shooter glasses, pint beer glasses, stemless wine glasses, champagne flutes, mugs and more. Personalized glassware favors are affordable, reusable, and unique to your wedding. Personalized glassware is dishwasher safe and will last for many years to come. Use favor glasses to serve beer, wine, champagne, juices, or hot beverages during your wedding reception. Guests can take their wedding glass souvenir home to display in a curio or china cabinet, home bar, or family glass cupboard. Glassware like coffee mugs, stemless wine glasses and pint beer glasses can also be used for DIY favors. Fill each glass with candy, nuts, or snack mix for guests to enjoy before or after the main course. Small shot glasses and stemless wine glasses are great for creating tasty dessert cups and make wonderful dessert table displays. Inviting out-of-town guests for your wedding weekend? Add a couple personalized stemless wine glasses and a bottle of your favorite wine to your wedding welcome bags along with cheese and crackers. Guests will be ecstatic when they find a gift bag filled with wine gifts, comfort foods, and local favorites in their hotel room. No matter your wedding style or theme, personalized glassware favors will compliment your table decorations and be a hit with every guest.